Men's ONYX Brighton Belt Brown Leather USA 42 Casual Silver Buckle Vintage 1993. Condition is Pre-owned. Great Condition! Shipped with USPS First Class Package. Brighton Brown Leather Inlay Belt. 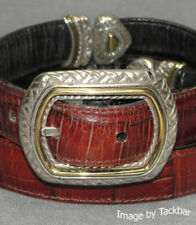 Item: ONYX By BRIGHTON Brown Croc Leather Western Belt. Full Length With Buckle:39". Full Length Without Buckle from first hole to last: 30.5" to 33.5". Hardware/Buckle Color: Gold Tone. Material: Leather. Narrows to textured ends with a chunky silver buckle for a Subtle Western Vibe. Nice Look. Condition: PRE OWNED IN VERY GOOD CONDITION - LIGHT SCRATCHES ON BUCKLE PLEASE CHECK ALL MEASUREMENTS BEFORE BUYING Size: 32 Color: BROWN / SILVER. 48 less Buckle. Condition: Good. Color: Brown. Brighton leather belt # 98080. See pictures. Color: black with brown trim. Strap length: 43". Buckle - 1.75" x 1.5". Length - 44". 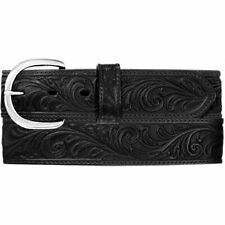 Brighton Santos leather belt # 67506. Strap length: 38.25". Color: brown/multi color. Total length: 40". Very nice brown leather belt with inset tweed detail. Brass buckle. 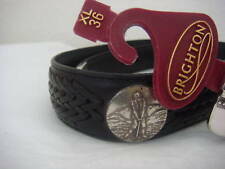 Brighton Leather Belt. 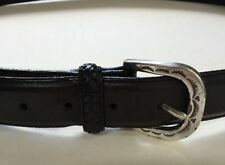 silver tone buckle. snap-on style (the buckle can be replaced with another). total length - 43.5". can be adjusted from 37"-43.5". width - 1-1/4". Onyx by Brighton leather belt # 19403. See pictures. Strap length: 42". Color: black. Brighton DENVER DIAMOND Belt Sizes 34, 32 NWT P3503. Since this belt is marked at 34, it would best fit a 32 pants size. Material: Top Quality Brighton Leathers. Silver-plate diamond studs set off by a trail of stitchery make its Western inspiration shine through. COLOR: BROWN AND BLACK BRAIDED. JUST CLEANING OUT CLOSET. TOTAL LENGTH FROM TIP TO TIP APPROX. Quality Brighton - made in USA. Solid Brass buckle. Very good condition - a few minor marks; one of the holes has marks/wear. Brighton Webster Brown Belt 30. Hardware Finish: Silver plated. Material: Leather. 1996 Brighton Leather Croc Belt. 36" overall length - silver buckle & connectors. 1" wide brown color. BRIGHTON ONYX BROWN LEATHER BELT WITH FISH MEDALLIONS - 46 -M40285. Condition is Pre-owned. Shipped with USPS First Class Package. Please see pictures for details and condition. This is my belt. Never worn. However the silver tip is scratched. Nice detail. Total Length of Leather: 41 1/2". Length of Leather to Middle Hole: 37 1/2". Width of Leather: 1 1/4". We will answer as quickly as we can. GUARANTEE AUTHENTIC & BRAND NEW multi Closure: Buckle Belt Width: 1.10" Ornament Material: Silver plated Features: Belts run true to size Brighton Tin or Pouch isn't included unless we stated otherwise The pictures may not show the true colors of the items. Most of the black spots or marks came from the light or shadow when the pictures were taken We enlarge the pictures to show the details. PLEASE refer to the size in our description. If you have any concerns, please ask the questions, before you make the purchase. Wear on strap end from buckling. Leather has scratches consistent with normal use. Hardware has discoloration and plate loss. 39” long, not including buckle. Overall length including the buckle is 41". Nice used golf belt as pictured. Material: Top Quality Brighton Leathers. Embossed Leather Design. Closure: Buckle. Hey guys glad you found us! BLACK GENUINE LEATHER BELT. 30" FROM THE BUCKLE TO THE MIDDLE HOLE. 35" LONG, 1.1/4" WIDE. Good luck! EMBELLISHED BROWN GENUINE LEATHER. LENGTH TO MIDDLE HOLE 36.5 "/92.5 cm.;. do not ask about. Brighton onyx Brown Calfskin belt made in USA Never worn, men's 36 or women's 16, imported Italian calfskin belt. Any questions, feel free to ask. Thanks for looking! Brighton Dark Brown Braided Belt. It is a reversable black and brown leather or faux leather belt with a gold tone buckle and it is about 1.25" wide. Brighton - Ravenna (Brown) M11685. from fold (at buckle) to tip of belt. Silver-plated single prong buckle. Order one size larger than your typical pant waist size. For example if you wear a size 36 pant - order a size 38 belt. LUXURY BRIGHTONFULL GRAIN LEATHER BELT with EXTRA BUCKLE NEW . Model 44607. •Belt width: 1 3/16" Belt Length 37 1/2". •Closure: Buckle. It is a size 34-L, black with silver buckle and studs. It is in nearly new condition. Nice Belt! From the inside of the buckle where the pin goes through the hole, the first hole is at 39" and the last is at 43". Good condition. Leather is in very good condition. Buckle shows wear. There is a zoom feature available. Top quality Brighton Leathers. Lizard Style Leather design.